My friend Pam is an Ah-Mazing cook and she hosted bunco last month. In my bunco group we play once a month and each member takes turns hosting the group and cooking dinner through out the year. It’s my turn on Friday, so I am in “Yay! I’m having friends over! …Holy cats! I better clean up around here!” mode. 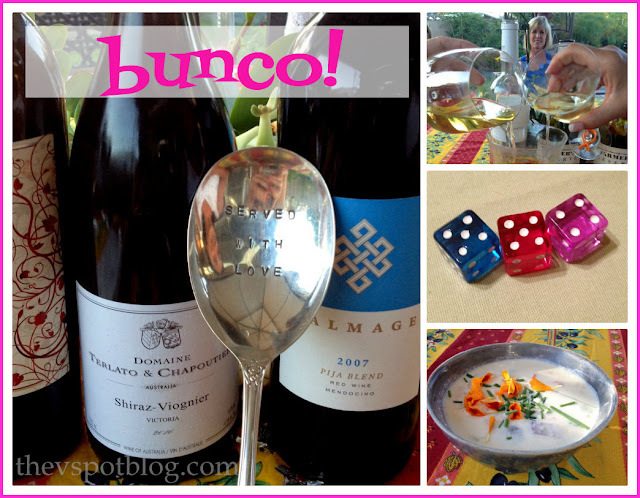 I decided that it’s going to be Bunco Week here on the blog as I work on a couple of projects to get ready. 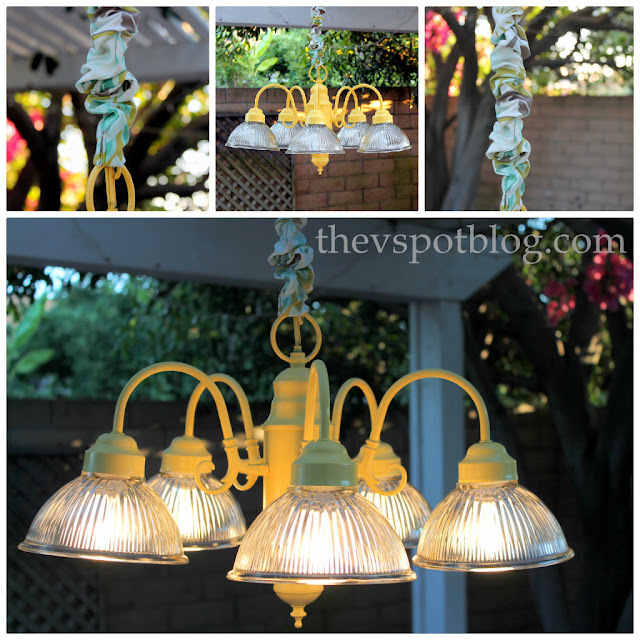 I gave this indoor chandelier (that I adapted to use outside) a make-over. It was turquoise last summer. Then it was black for Halloween. Then I took it down. Then I just remembered that I have it…. How about yellow? I also needed to make a cover for the cord, but first things first. Clean the chandy, then make sure you tape off the electrical parts. I simply wrapped the sockets with plastic grocery bags and a little tape in order to protect them. I opted to use paint that was already in my stash, but as it tuns out, this cheery yellow was just the ticket. I wanted to hide the cord, so I did my “No-Sew” best to make that happen. Remember the chairs I recently recovered…? Yeah. I’m tired of the fabric on the chairs, but it is perfect fabric for a cord cover! So I pulled it off of the cushions and turned it into a cord cover with a glue gun and an iron. 1. Cut off a strip of fabric about 5 inches wide. The length didn’t matter to me, because I was going to connect several lengths of fabric together. 2. Iron the strips of fabric. 3. Run a bead of hot glue and press the two ends of fabric together to create a seam. 4. Iron a “hemmed” edge into place. It does NOT have to be perfect! It’s going to be all scrunched up along the cord, right? Who is going to inspect it? The Seam Police? Get ‘er done and move on! 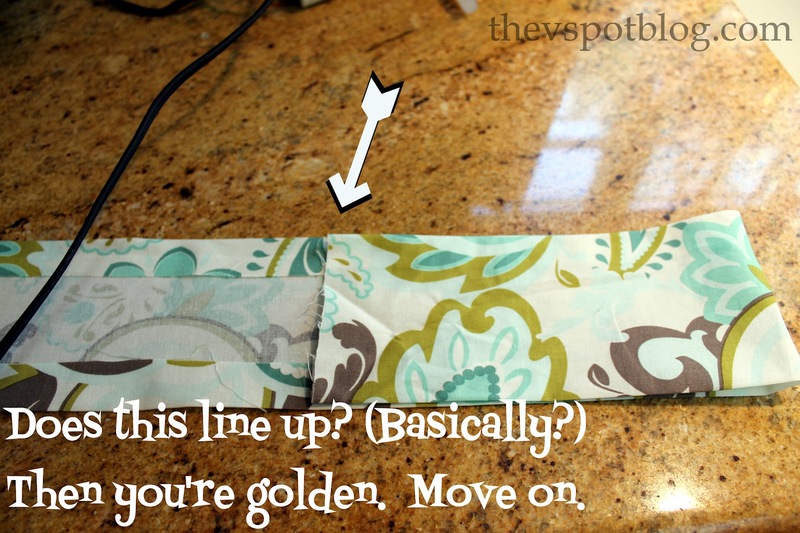 OK, so once you have the length of fabric pressed and “hemmed” it’s time to (*ahem) sew it up. It’ll work out just fine for my bunco night! My house is small… we need to have a table outside. And we need to be able to see the dice, Done! Don’t play with matches or electricity. Always wash your hands after using the bathroom. Don’t eat expired food. Don’t run with scissors or use your hair dryer in the bathtub. Use your manners and remember to say your prayers. It’s looks great and super easy! Have a great day! Super cute! Love the cheery yellow and your makeover method. I am not big on measuring unless it’s really necessary 😉 I’m sure no one will notify the seam police. New girl here. Love this blog and the post is so creative. Yellow – I always like this tone of yellow. Your guests are going to love it. I’m so excited you posted this! I’m in desperate need of a cord cover in my new craft room/blog office/sewing room AND with all these lovely shiny brass chandeliers running around my new to me house, I’m dying to paint one! Pinning for future reference! Thanks Viv! Bunco is fun. I’m impressed that yours is a Bunco-and-supper club. I’ve only ever been in Bunco groups that did appetizers and drinks. I haven’t played in a long time; maybe I should start a new group! For sure having a dozen women in your house is good incentive for getting things done! Your revitalized chandy looks fun! 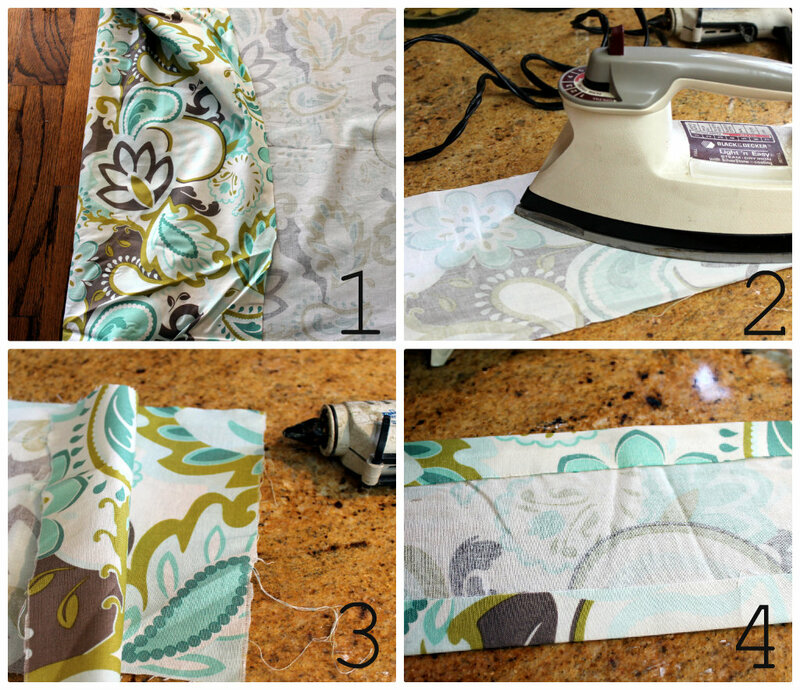 So what fabric have you used to re-cover your chairs? Will that be part of Bunco Week? BTW, you can use the same fold-and-hot-glue method to recover a cord on a chandelier that’s already hanging. 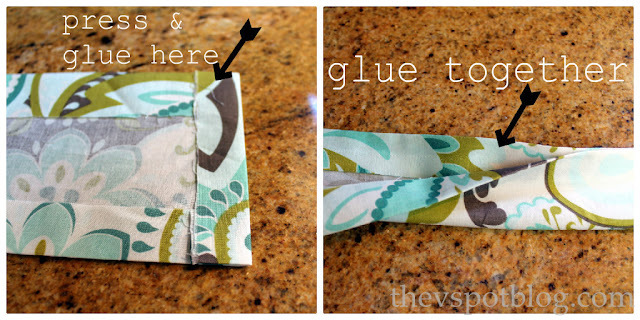 Since there’s no sewing involved, you can just take a length of fabric, your glue gun, and scrunch as you go! You should, however, not stand in the middle of your dining room table if it happens to contain unsupported leaves. Just sayin’. I’ve been wondering what you’d do with it next…I love it! Also. Your disclaimer at the end. Kills. me. I need to add to my never ending to-do list find a chandelier! I love bunco! I started a group 3 years ago because I needed something to look forward to as my only child went off to college. These women have become my closest friends! I love your ever-changing chandelier! This latest color scheme is a favorite. What a gorgeous makeover! 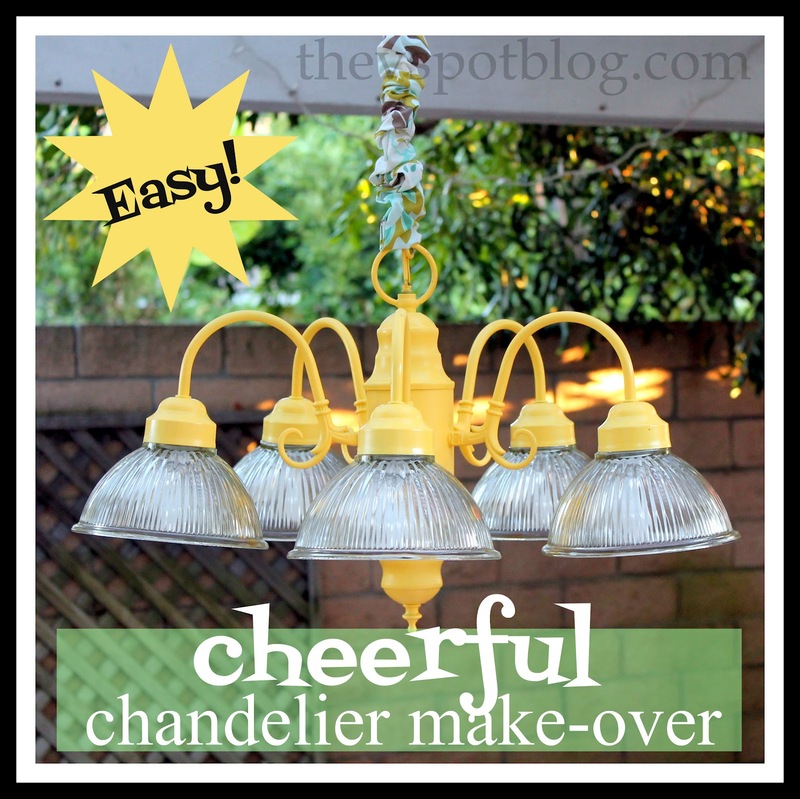 I love the bright and cheery color you chose for the chandelier, too!